I took a class with Gloria Loughman back in the spring of 2007 (I think, counting back). 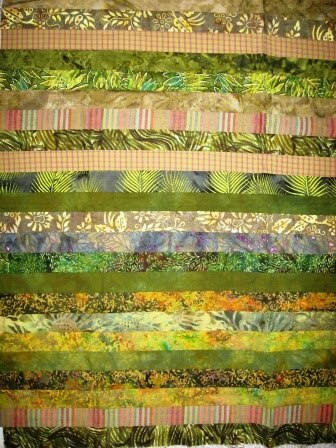 It was a one day class working on a crazy quilt style quilt. She was teaching a few other classes that week but I could not do the days she was teaching the design classes. 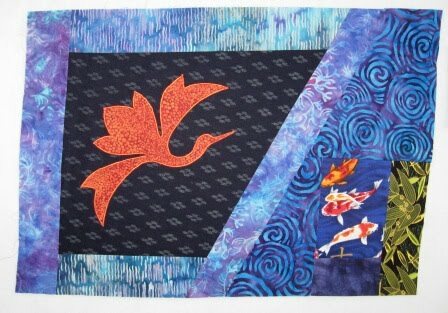 I thought I would be great to still be in her class and get to see her quilts up close. 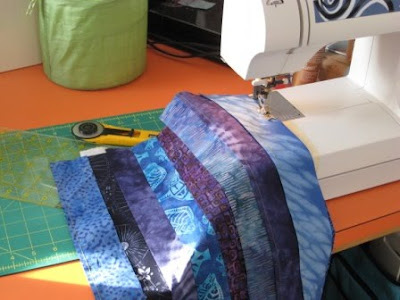 We started the class by doing the machine applique of a few blocks and maybe one row of fabric around. We also cut out some special prints we were to bring. 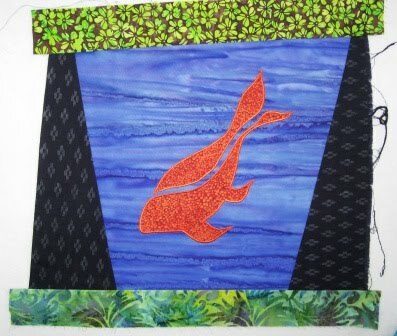 If you can see I wanted to do a fish pond theme. I got some great fish fabric and worked on the birds and one fish. I also built a fish pond this same spring (with my husband's help). This project has been in a box all this time. I have taken it to many retreats but not worked on it since class. I dug it out this week. I started by placing the blocks on the wall. I had to iron most everything that came out of the box. 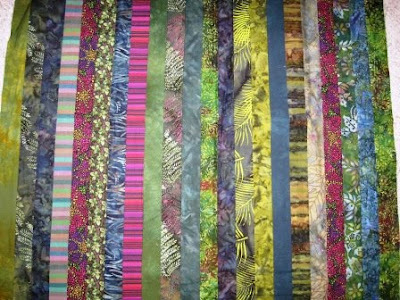 I also got digging around in some other fabric, as I was sure I had some green strip sets that I did not use on another quilt. I found this. I forgot about this green fabric. 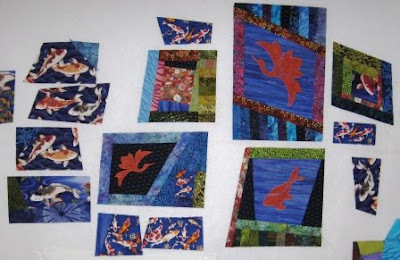 It is from poverty piecing I did with a friend Lou, in a class. I do not think I will use this but keep it out in case, the wrong greens. Here it is the sets I was looking for. 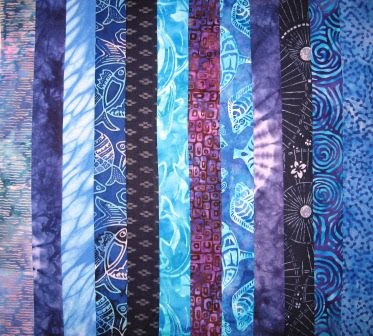 Once I started to work on a block or two again, I could see I wanted more Blue. So I made a Blue strip set. Here is my machine working on a blue set. I get late day sun at my machine in the winter. It is so nice to have sun shine coming in. Here is all the blocks at the end of a few days work again. 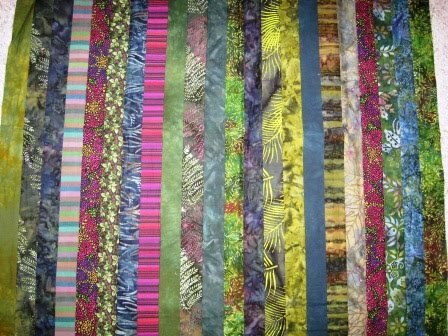 I think I will work hard on this quilt for a while now. 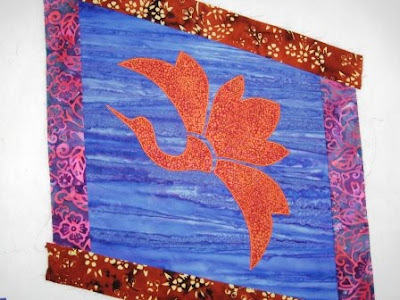 I want to make a set of quilts for the living room. 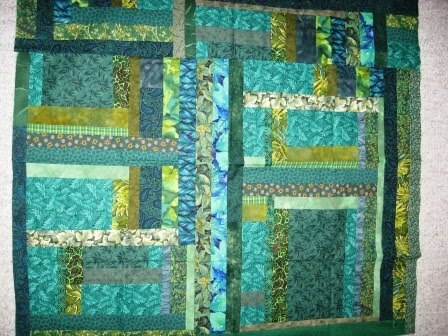 I may have many posts on this quilt because it will change as I get more done. I will do more blocks and add to the blocks and then the rows. I can show you how this quilt processes because it was started in a class and I will not enter it in a major show. I am also getting the binding done on a quilt I plan to enter in a major show. I have to get photos done too. I dislike that part.